The anonymous call for a "jasmine revolution" in China's major cities was made online, first on a website run by overseas dissidents, then on Twitter, which despite being blocked is still widely used by activists in China. But unlike what happened in Tunisia and Egypt, where such efforts prompted massive street protests that eventually toppled both governments, the biggest response in China was from the state. Over the weekend the government rounded up lawyers, activists and dissidents, increased online censorship and deployed massive numbers of police to quash any demonstrations. In Beijing, the protest was supposed to happen in Wangfujing, a busy shopping street in the center of town, a short walk from Tiananmen Square. On Sunday afternoon the crowds of shoppers met a massive police and media presence. Police in Beijing detained at least three people, including one man who placed a jasmine flower near a McDonald's restaurant near Wangfujing, and another three people were held in Shanghai, according to the Associated Press. Otherwise, there was little sign of protest. Even before the call for demonstrations emerged on Saturday, authorities had heightened the pressure they exert on China's domestic community of political activists. Last week, lawyer Tang Jitian was taken away by police in Beijing after a dinner to discuss Chen Guangcheng, a blind legal activist living under strict house arrest with his wife. That couple was severely beaten by police after they managed to smuggle out a video documenting the conditions they now endure in their Shandong village. Police also detained Jiang Tianyong, another lawyer who was at that Beijing dinner, during the weekend. Over the weekend the crackdown expanded. Human-rights activists estimate that by Sunday evening about 80 people had been affected, forced to travel from their homes, put under house arrest or placed under some similar form of restrictions. 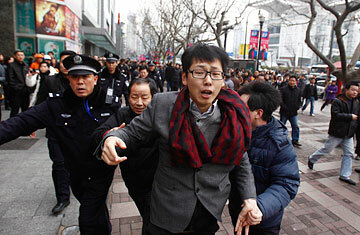 They included Teng Biao, a lecturer at Beijing's University of Politics and Law, whose house was raided by police. China's restrictions on what information Internet users could access were also heightened. The term jasmine was blocked from searches on Sina Weibo, a popular Twitter-like microblogging site. Some users also reported difficulties accessing services like Gmail, Google's Web-based e-mail. China sees large numbers of demonstrations each year set off by everything from forced evictions to pollution to nationalist fervor. The government employs a range of responses, sometimes allowing limited protests in hopes they will die down, as with rallies last year to protest Japan's detention of a Chinese fishing-boat captain in disputed waters. But organized protests that directly challenge the authority of China's ruling Communist Party usually face a swift and stern response. "This shows just how nervous and how insecure the Chinese government is," says Wang Songlian, Hong Kongbased research coordinator for Chinese Human Rights Defenders, an advocacy group. "It is aware of how many forms of grievances are in society that are simmering despite the prosperity on the surface." A protest slogan that circulated online began with the lines, "We want food, we want work, we want housing." But even the site of Sunday's thwarted protest in Beijing  a shopping street packed with Chinese consumers  indicates just how difficult it would be to spur average Chinese to revolt over livelihood issues. Certainly the government faces pressures from unemployment, including a significant number of recent college graduates without jobs, and inflation, especially rapidly increasing food and housing costs. But continuing economic growth has proven a powerful balm for the widespread grievances that gripped the country during the Tiananmen protests in 1989. Chinese leaders have shown sensitivity to those concerns. On Friday President Hu Jintao warned provincial and central government officials that China was "still in a stage where many conflicts are likely to arise," according to a report by the state-run Xinhua news service. The report did not indicate that Hu mentioned the pro-democracy protests spreading through the Middle East, but his comments indicate that the Chinese government is focused on reducing the chance that widespread social dissatisfaction could spur unrest. He called on the officials to "solve prominent problems which might harm the harmony and stability of the society." While Sunday's protests were a failure, they may have a lasting significance, says Nicholas Bequelin, a Hong Kongbased researcher for Human Rights Watch. Despite the detentions of activists and widespread Internet restrictions, he notes, dissidents were still able to spread an online call for coordinated protests, prompting a significant response from the government. "Information is growing faster than censorship," he says. "I don't believe that the Internet itself will bring democracy to China, but it changes people's attitudes and the association between themselves and the rest of the world. It's an important shift in people's minds." The government won this skirmish and looks capable of blocking any immediate threats to its hold on power. But the ease with which dissent spreads online means that while China isn't likely to see its own jasmine revolution, the authorities won't be resting easily either.